Do you have what it takes to enter the arena and battle to the death with the most powerful Mages in the world? Mage Wars combines the best elements of customizable card games and tactical miniatures games to create a unique, fast-paced, strategic fight to the finish! 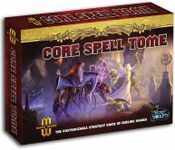 Mage Wars: Core Spell Tome contains 110 cards that feature additional copies of the most useful spells from the Mage Wars base game. Whether you need an extra "Block", "Dispel", "Pillar of Light", or "Thunderift Falcon", with the Core Spell Tome, you will have the spells you need to vanquish your opponents in the Arena. With this supplement, you have the ability to customize your Mage and explore various builds adding depth to your tactics and assault. You need the Mage Wars base game to use this expansion. This file is a listing of each of the spell cards contained in the Core Spell Tome.